Are we still going in the right direction? We were challenged a little bit though to be creative. We didn't bring any folding chairs with us and there weren't any camping tables available either. Hmmm... Problem....? Nooo, of course not! There were some big boulders on the edge of the river and those were an excellent alternative for the chairs. 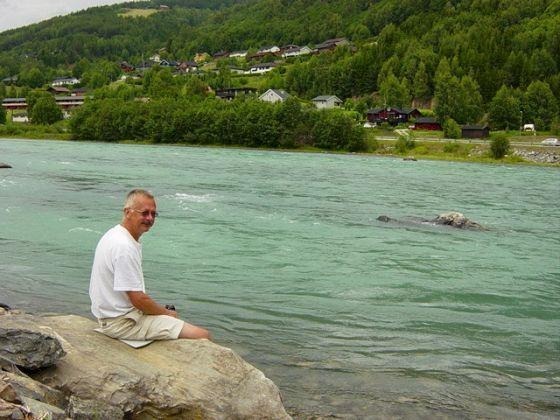 Feeling tired of the trip; it was so relaxing to sit here, listen and watch the river flow by, and having a sip on a drink. It is time to get on the road again, new day and new adventures. When you see this road sign it means you are approaching a toll gate. 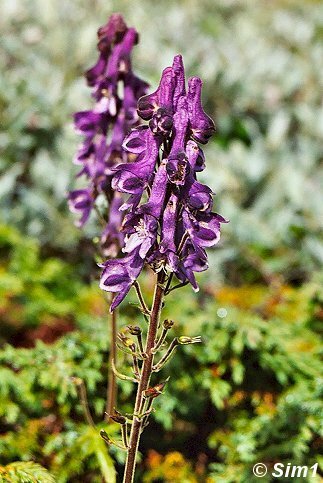 There are quite a few of them in the area of Otta and Rondane National Park, but I came across a few others as well in Norway. Around Rondane the toll wasn't high, but if you drive up one of the small mountain roads in the area you will with no doubt come across one of these toll roads. It's good idea to make sure that you have some small change with you. The toll posts are unguarded so you won't get any change back when you don't have the correct amount available. I got into that situation a few times, and I have to admit I skipped the toll so now and then because of that, without any problems. New day, New adventures, and first on the list for the day is a visit to the Kvitskriuprestein, a weird rock formation, close to Otta. The place is on a little side road into the mountains around Otta, and it is not really easy to find. From the E6, travelling north, just outside the village of Otta, take the side road to the right. Follow this little road through the Uladalen along the river Ula for approximately 3 kilometres, and you will get to the Kvitkriuprestein. 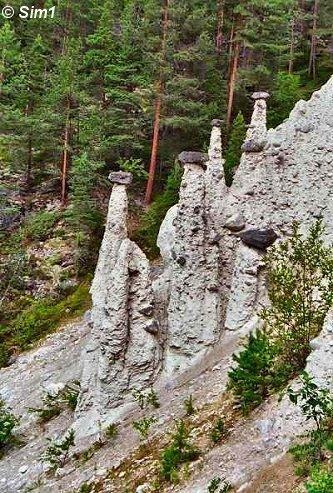 The Kvitskriuprestein (or priests of the white scree) is an example of a form of erosion that is very rare in Northern Europe. The material the pyramids are made of white moraine soil. This type of soil is left over from an earlier Ice Age; it is hard as concrete when dry, but easily washed away by rain and flooding creeks. 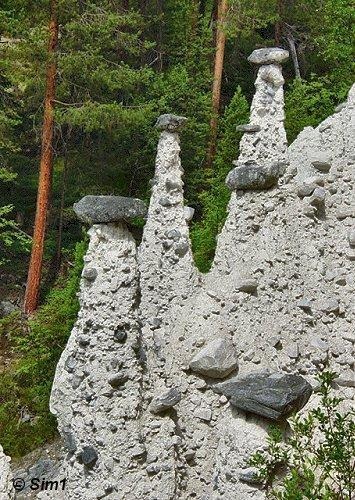 The rocks on the top of the pillars have protected them, while the rain washed away the surrounding soil, giving them this weird look. From a distance, the white pyramids topped by the dark rock hats remind of a group of priests, and that is why they got this name. Below you see a closer look at the Kvitskriuprestein. The rocks themselves are fenced of, as they are protected by Royal Decision June 24. 1977, but you have a good look at them from behind the fence. The rocks aren't that impressive too see or maybe I saw too many fascinating rock formations on my visit to the USA (Monument Valley, Arches and Bryce Canyon). Considering the steep and exhausting climb to get there, I am not sure if it is worth while going here. If you have a few days in Otta, it might be a nice idea, but when you are limited in time, I would skip it and rather spend some more time in Rondane National Park instead. 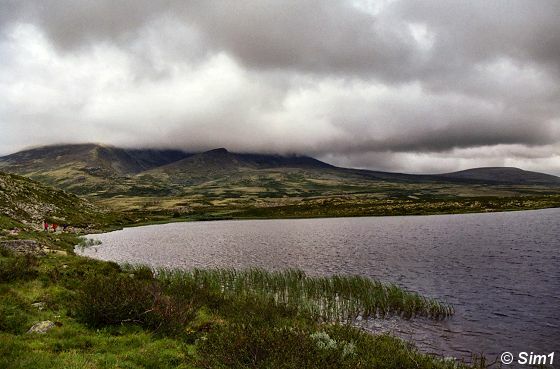 We are on the road again, but now on our main destination of the day: Rondane National Park. From the E6, take a side road to the village of Høvringen, a very picturesque road to drive. At first the road is climbing steep up, giving a beautiful view of the valley you just left. 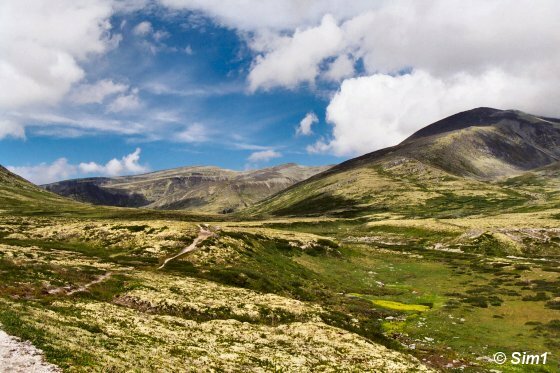 And after that you will be amazed by the landscape unfolding in front of you: Rondane National Park. The road isn't without obstacles though, hahaha, sheep are walking around freely here. 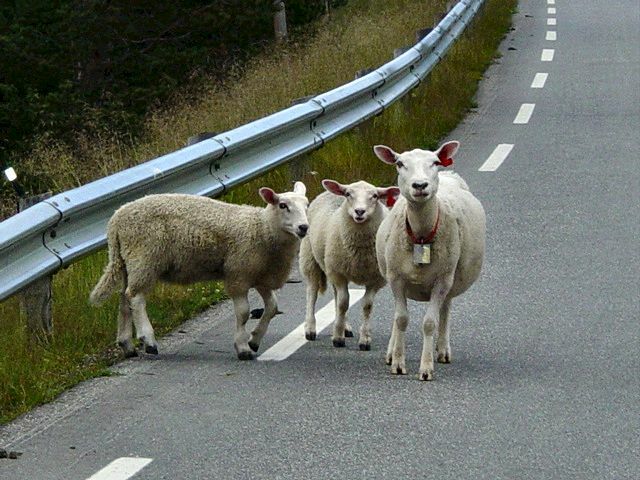 So don't be surprised to make a stop on the way because some sheep are blocking the way. I have to add a word of warning though! 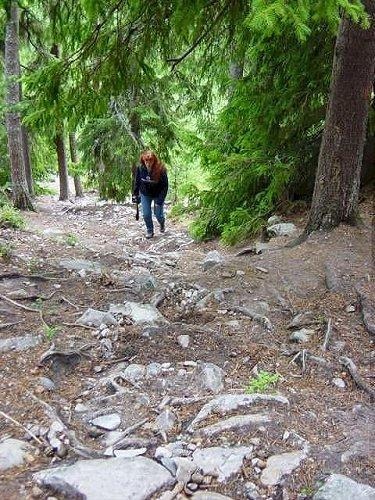 Although the trails are marked reasonably okay, you have to pay attention of where you are going. This was one of the clearer signs on the trail, but it is very easy to loose which trail you are on. 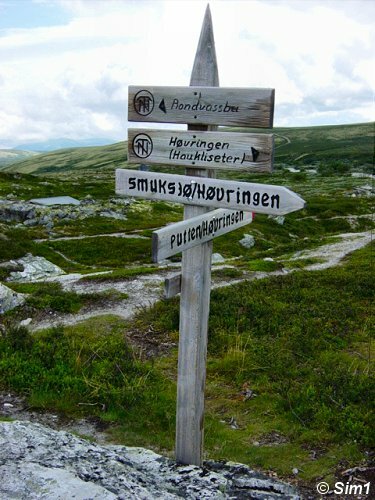 So I would advice taking a good map with you as well and don't rely only on the route markers when you go for a hike in Rondane National Park. When I arrived at the Smuksjøseter I parked the car and got outside to take a look at the surroundings. My first emotion was disappointment as the weather was looking bad and I had been looking so much forward to this day and to this hike. The weather was cloudy, the temperature was rather chilly and there was even a little threat of rain. I was so disappointed that I somehow even considered not going on this hike at all. I was afraid that I might get soaking wet by rain and maybe that it would be too cold as well. But my fears were in vane! I am so happy I decided to do make this hike after all as you maybe can see by the happy look on my face in this picture. After my initial hesitation I enjoyed the hike to the fullest. The hiking made me nice and warm and the beautiful nature made me forget about the cloudy weather conditions as well. This picture was taken on one of the many little breaks I took during the hike; sitting on a rock, taking in the beauty of the surroundings of Rondane National Park. 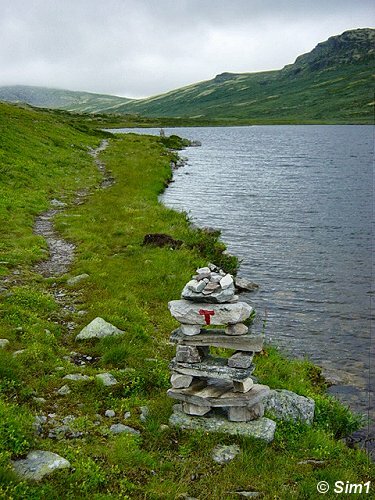 The main part of the route on the way to the Peer Gynt Hytta followed the shores of two little lakes. In front of me, further in the distance, I could see the mountains of Rondane National Park, with its peaks often covered in a thick layer of clouds. On the other side of the lake I could see some of the lower mountains of Rondane National Park, almost rising up out of the lake. In the distance, on the opposite side of the lake from where I was, I could hear the cosy sound of sheep bells. This was the only sound around; it was so quiet and peaceful here. After hiking for about 4 kilometres we arrived at the Peer Gynt Hytta. Here the landscape seemed to open up for a little while and I could see for miles and miles in the distance giving me a stunning view over parts of the park. 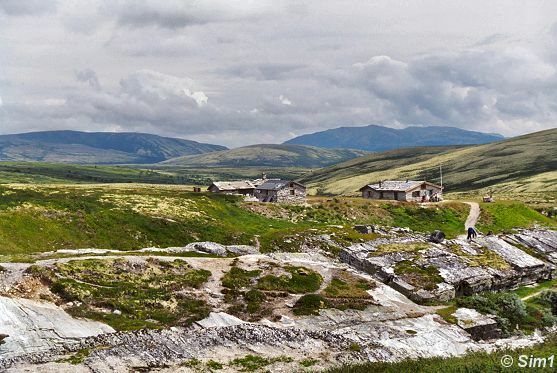 In the picture you can see two little cabins at the Peer Gynt Hytta that are used as accommodations for hikers. 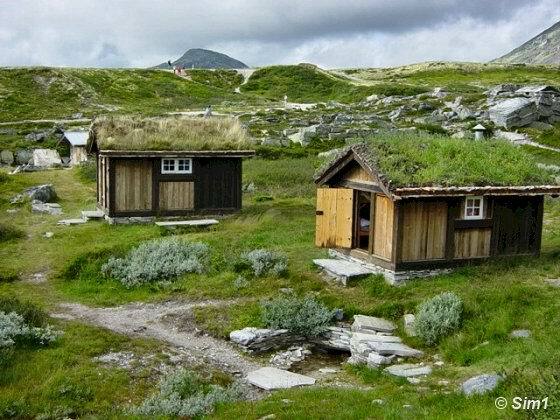 I love these grass covered roofs, something you can see a lot while travelling through Norway. I think it looks so picturesque and makes houses like this almost disappear in the surrounding landscape. I would love to stay here overnight some day. Although these cabins look small, they did seem rather comfortable to me, and of course they are situated in the middle of a stunning landscape. I hope to return to Rondane to do some more and longer hikes, and maybe make use of these types of cabins in the park. 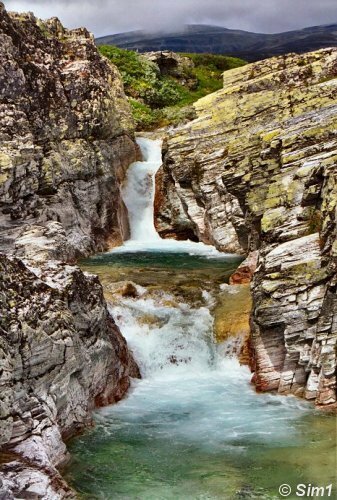 Before arriving at the main building of the Peer Gynt Hytta I had to cross a little gorge where I saw this beautiful little waterfall carved into the rocks. I could get rather close to the waterfall by walking along the river on the left side of it. From here I had fantastic view on the waterfall and I stayed here for quite a while to enjoy the view. The sun even came out for a minute, to highlight the beauty of this little fall. Now I only had one problem left.... how to get across the river to the other side of the gorge?! The only option was this little metal-grid bridge... eeks! Hahaha, I had to pass that bridge to get to the hytta, but it was scary! I hardly dared to look down to the gorge underneath me and the quick flowing water of the waterfall. We had a lovely break, eating waffles with sour cream and strawberry jam. Yummy! Of course I had a cup of tea with that. It tasted great, hahaha, but I was soooo surprised with the sour cream though! I thought I had gotten whipped cream and I can't really say that tasting the sour cream was a pleasant surprise, lol. So I scraped it of my waffles and enjoyed just the strawberry jam and my hot cup of tea. A nice moment was to see when a horse was letting loose. I still don't know if they done that one purpose or if it was an accident. But seeing the horse run into the fields of heather so happily jumping up and down gave me such a happy feeling. It ran for quite a while just jumping of joy. So which way do we go now??? We made our own little loop trail by choosing parts of several hiking trails, making it not too long of a hike and avoiding too steep climbs. 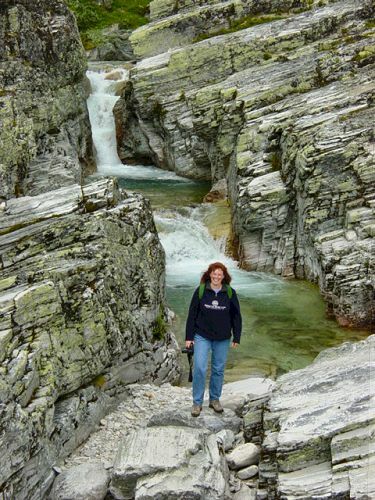 I wasn't so well trained in hiking yet, and certainly not in mountain areas, so I was a bit nervous of it. But I didn't need to be, the trail was very good to hike and I enjoyed every minute of it. I was capable of hiking much more than I ever dreamed of. 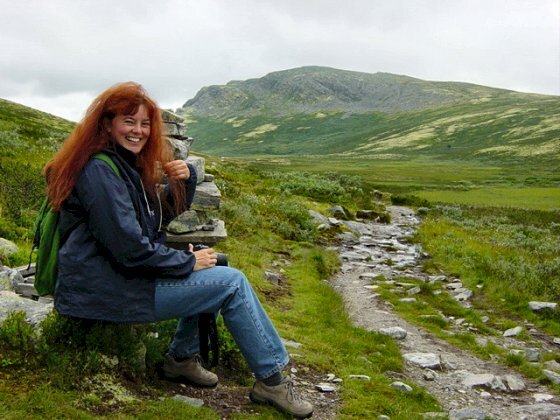 You can see proof of that on my Jotunheimen (Norway page) where I astounded myself by the hike, or better said climb, that I made there. Amazing considering that that hike was only a week after this little one, lol. If you read the Jotunheimen page you will understand what I mean. 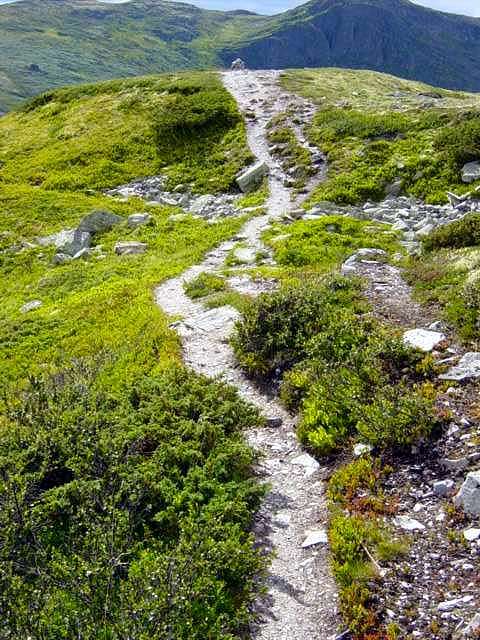 Rondane National Park has some good detailed maps where you can find all the hiking trails available in the park. The total length of the hike we chose today was 9 kilometres. Let's continue with our hike.... The second part of the route was totally different from the first part. This photo is made close to the Peer Gynt Hytta, where we had some beautiful views over a picturesque valley. I loved seeing all the flowers in bloom with the mountains in the background. The way back of the hike offered beautiful views over a much more amazing landscape than the first part of the hike as you can see in the next view pictures I made in the park. We arrived at a little stream that we had to cross. This was also the spot where two hiking trails split up. As you can see you have to pay attention where the trail signs are, hahaha, as they are sometimes positioned on the most creative places, lol. A view stepping stones helped us crossing this little stream without getting wet feet. 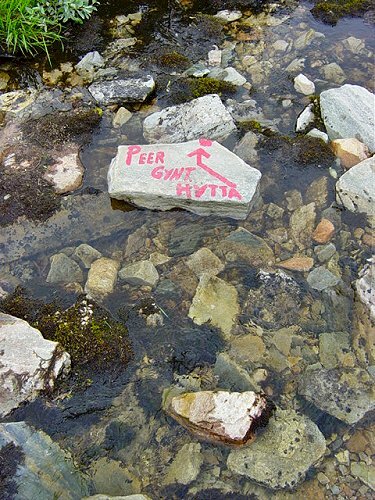 Next to the stepping stone was this rock in the water telling the direction to the Peer Gynt Hytta. The one thing I remember best was the amazing colour scheme of the park. The different shades of green and yellow are the dominant colours you can see here, but it does make the landscape look breathtaking. I never realized that there are so many tones in colour between yellow and green. The best painter couldn't have composed the colours any better. The best moments for me were just standing still and looking around in amazement. I felt so small and unimportant when seeing this landscape, that is so enormous and never ending, it was a wonderful feeling. 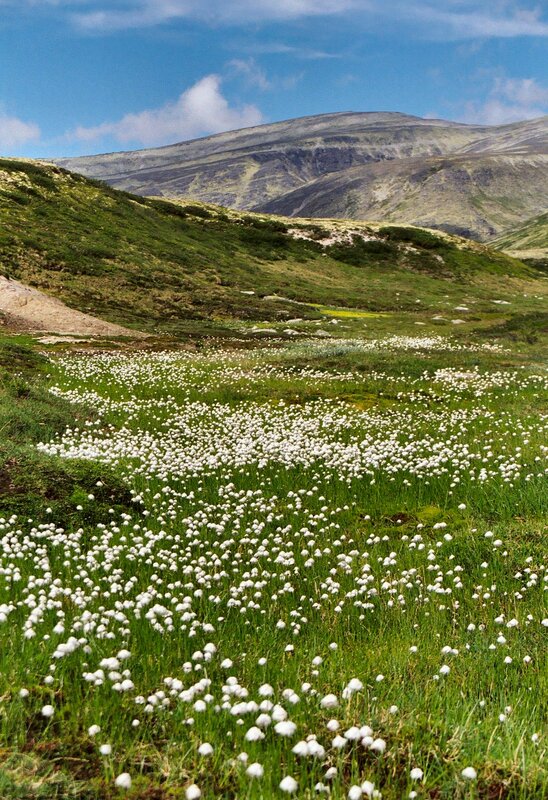 Although not in abundance around (not at the beginning of August anyway) you can spot some beautiful wildflowers in Rondane. The National Park covers an area of 572 km2 and was established in 1962. The wildlife in Rondane does not differ much from the wildlife in other mountain areas in Norway. Although I didn't spot any myself, there are reindeer and moose in the park. Other animals you could spot are rabbit, red fox, arctic fox, lynx, wolverine and various smaller animals (mice, weasels, lemmings). There are lots of birds in the park; 124 varieties in total. A few examples are the Snipe, Sandpiper, Ringed Plover, Crane, Buntings, Rough-legged buzzard, golden eagle and many many more. As you probably noticed I really love this National Park and would love to return to explore more of it. Rondane is so peaceful and quiet; I guess tranquil would be a good word for it. The national park is not shouting out loud with spectacular natural features like for instance the Grand Canyon, but the park certainly does have something special. There is a harmony in the mountains, valleys, streams and colours of the landscape. It's a place where I loved to be, where I came to rest, was amazed, felt tranquil myself. It's a place that I love. 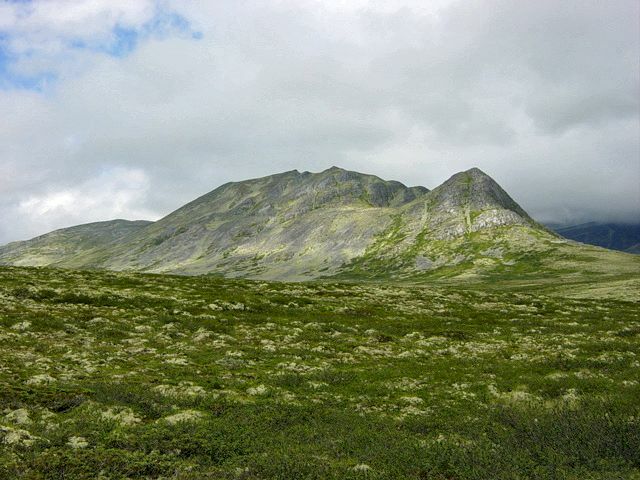 Most of Rondane is a high mountain-plateau at about 1000 - 1500 metres above sea level. From this plateau a number of great mountains rise in the central mountain area, up to about 2000 metres. There are 10 peaks of more than 2000 to be found in the park. The mountains are fairly round, and do not have very sharp peaks as you would find in Jotunheimen National Park. The hike is coming to an end. The last little bit to hike is a climb over a hill and we were back at Smuksjøseter and the car. The hike I made was quite easy, with an easy to walk on trail and without any steep climbs or hills. 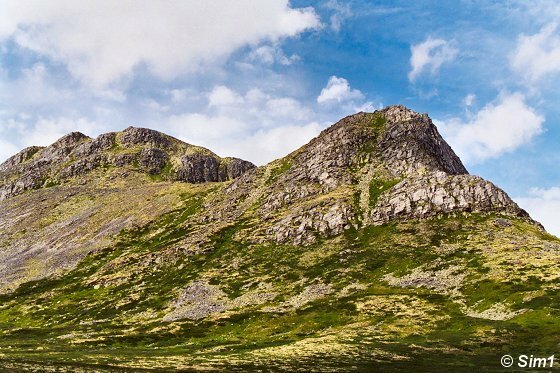 You don't really need to be in tip-top shape or a very experienced hiker to make this hike. So if you are not afraid of doing a 10 kilometres hike, with some light up- and downhill walking on a partly rocky trail, you really should give this hike a chance, its beautiful! Of course there are much more challenging hikes around, and when I will return I will certainly try to get up to one of the higher areas of the park. The view from there must be so different, but with no doubt, stunning. 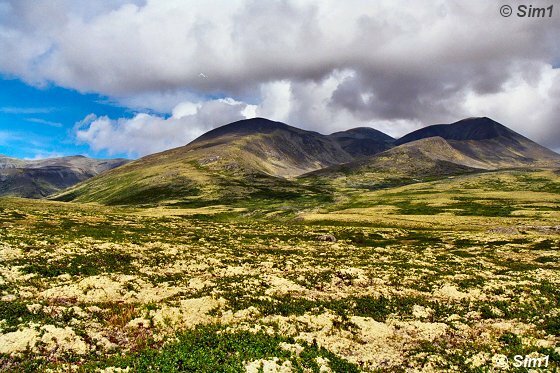 Where is Rondane National Park? 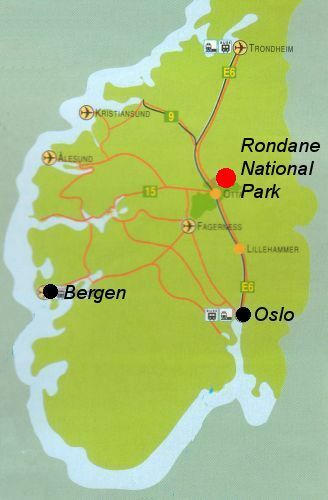 So where is Rondane National Park? 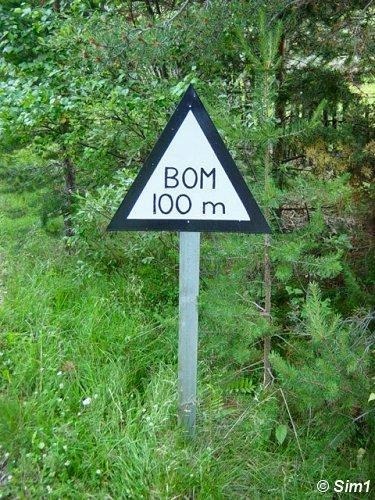 It is close to the village of Høvringen, which can be reached by taking a side road off the E6 and following that for 8 kilometres. 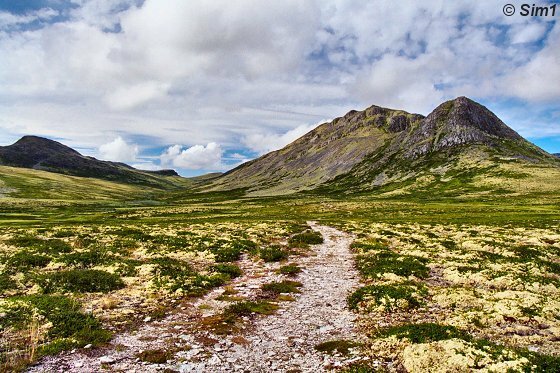 Rondane is about 300 kilometres north of Oslo, 520 kilometres north-east of Bergen and 135 kilometres north of Lillehammer.